Despite the hilly areas, Lisbon can be bike friendly. To prove it, café VelócitéVelócité opened in September 2012 by the new bike path. This is the only café in Lisbon with this kind of concept: a Café and Bike Shop, although some others are arriving to town… I really love bikes, I hope they are here to stay. The reality in Lisbon is quite different from the north European cities like Amsterdam or Berlin where nearly 50% of the population use bikes as a primary means of transportation. The population of bikers in Lisbon tends to increase thanks to the crisis, raising taxes, awful traffic, eco consciousness and a little help of the town hall, providing the streets with new bike paths. Sometimes it takes time to change mentalities… and I really hope they change soon. 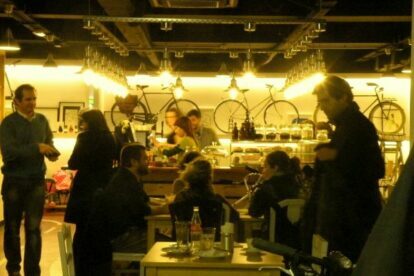 VelócitéVelócité, located near the GulbenkianGulbenkian Museum, has snacks, drinks, a cool brunch, spare parts for your bike, and tips from local bikers. The place is spreading the word about biking and the concept is great: bring your bike, park it, go for a snack and buy some extras for your ride. I’m a fan of bikes and I use it combined with the train to cover my house to work commute. Unfortunately, some cycleways are packed with people – so, bike carefully so you can avoid human bowling and old ladies slalom – as people aren’t used to bikes. Bike safe and be careful. It’s great to bike in Lisbon :).